Over 3,200 PocketWGU Users -- And still growing! In December, PocketWGU crossed the 3,200 user mark with over 1,200 users on iOS and more than 2,000 Android users. The DevTeam wants to say thanks to the great WGU community for continuing to make this effort a sucess. Thanks! In related news, the Android version is now avialable in the Amazon App Store. Additionally, Amazon is currently reviewing PocketWGU for release on the Kindle Fire (quite a few requests for that!). The Amazon store has some nice features for providing comments on the app and for allowing developers to respond to those comments. Take a look at the link if you're interested. Finally, a brand new version of PocketWGU for Android is in the works and will begin testing soon. 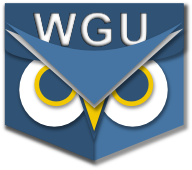 All WGU students, faculty and staff with Android devices (2.0 or later) are welcome to participate in the testing. Head over to the PocketWGU page on Google+ to find out how.